What is the best way to get rid of invasive plants? That is the $64,000 question, is it not? If there were a simple answer, the whole matter of fighting invasive species would not be such a thorny issue. Having said that, some solutions will be offered below that will at least point you in the right direction in solving this problem in your own yard. What Is the Best Way to Get Rid of Invasive Plants? The "best" way to get rid of an invasive plant will depend, in part, on your own preferences. Do you wish to stay organic? Then the best way for you to get rid of invasive plants will probably entail more work than it would for those willing to use chemical herbicides. For many people, remaining true to their organic landscaping principles is more important than getting rid of invasive plants quickly, and they will gladly take on the extra work if it means that they can stay natural. If, on the other hand, you opt to go the chemical herbicide route, read what is written on the product's package very thoroughly before buying. The information on some will indicate that they are specifically for "woody" plants (for example, Ortho's Brush-B-Gon product). Glyphosate is a very popular chemical herbicide (sold under the brand name of "Roundup"). It is a non-selective type of herbicide, meaning that it will kill just about anything—including your ornamental landscape plants, your lawn grass, etc. (so be careful!). Because chemical herbicides such as Roundup are non-selective, the best way to get rid of an invasive plant by using such a product sometimes comes down to circumstances. 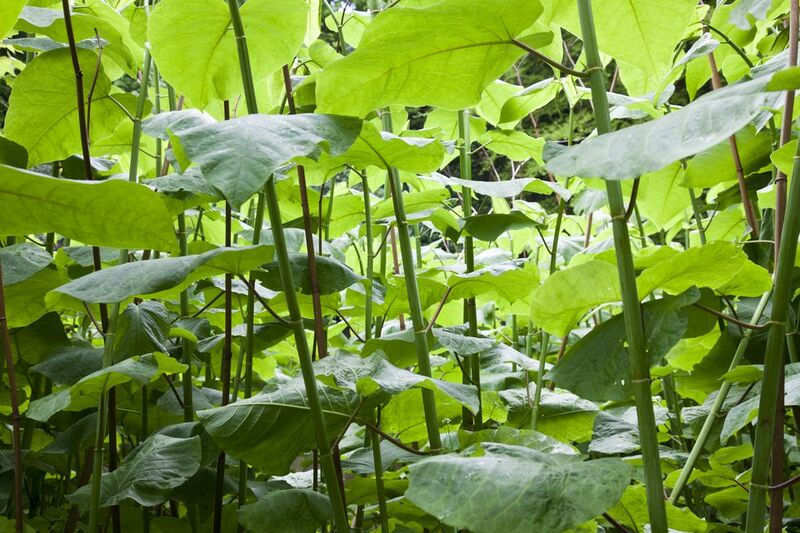 For example, if you wish to use Roundup on Japanese knotweed plants (Polygonum cuspidatum; see picture) that are poking through your lawn, you may wish to use the herbicide injection method, rather than spraying. That way, you can control the Roundup so that it does not end up on your grass since it would kill it. Is It Possible to Get Rid of Invasive Plants Organically? If you would rather stay organic, you can try using vinegar as an herbicide. Some organic gardeners even use something as simple as boiling water to kill weeds. But do not get your hopes up too high, because, the fact is, neither vinegar nor hot water will work on everything. They will have little effect on a tough perennial invasive plant such as Japanese knotweed. If vinegar and scalding water do not work on a particular plant, try another method to get rid of it. Staying organic is all about experimenting. In some cases, the best way to get rid of invasive plants naturally will be by choking them out by smothering them with tarps, etc. Speaking of experimenting, some may opt for a multi-pronged approach, trying a little of this and a little of that. An example is tackling the problem of eradicating Japanese knotweed, is analyzed in great detail.